Studying with Rabbath: 20 Years After! I first heard about about Rabbath through a composer in Barcelona (my hometown, where I still lived at the time) named Enric Palomar, who had written some flamenco-infused music that was going to be performed by bassist Barry Green, a world-class classical bass soloist that had been one of Rabbath's more outstanding pupils. At around the same time I got to meet another younger american bassist, Jesse Murphy, who came to Barcelona to perform with The Bloomdaddies, a jazz-psycho-funk band lead by Chris Cheek and Seamus Blake who had Jorge Rossy on drums. Turns out that Jesse had studied with Paul Ellison, another of the most outstanding Rabbath disciples. Shortly after meeting him, Jesse encouraged me to buy the Rabbath books, on the promise he'd teach me a lesson. That morning I went to a music bookstore, got the books and in the afternoon got a free lesson from Mr.Murphy (while in his roller-skates!). In the meantime, I faxed Barry Green, obtained Rabbath's address from him and wrote him a letter - Yes this is the pre-email era! François graciously replied a couple weeks after with his phone number. That day I gave him a call and we set up a date. A few weeks later I went up the stairs of the Rue de Clichy apartment and met the man. The first thing he said to me was "Thanks for coming from so far away! I'm so excited to teach you and to learn from you". Then proceeded to make me coffee! While we had coffee he said "this is a day you probably will never forget", and right he was!! I had black hair back then! Take into consideration that at that time I was a real beginner on the instrument. I had done a few months of classical training with a good teacher in Barcelona named Ferran Sala, and a few lessons with some other teachers, but I was suffering from tendinitis on both my arms and playing the German Bow. I could barely play! François took me right away, no questions asked, which for a musician of his stature is rare. He said: “Better to take you as a beginner than as an advanced player, so I don’t need to fix you much, we can build from the ground up.” Needless to say I was in total awe. During the next three years I traveled to Paris for lessons often, studied diligently and worked hard on my craft. During that period, I also got to meet some wonderful bassists, students of François who are still great friends today (although I regretfully don't see them much if at all!). These were seminal years for me as a bassist: Rabbath expertly guided me to lay the foundation that allowed me to develop as a serious professional performer, but most of all, he gave me the confidence and the freedom to become whomever I wanted to be. At some point I confessed to him that I didn't see myself playing classical music. He replied: “That's great, do whatever you want to do, but do it well, and you’ll be fine.” This seems so obvious now, but at that time that really helped me boost my confidence to pursue becoming a jazz bassist, which is what my dream was. Three years after starting to study with him I was one of the most in demand bassists in Spain, often playing as a pick up player for jazz musicians coming from New York. At around that time I met Ben Waltzer and Bull McHenry who had just moved to Barcelona and whom introduced me to a whole new world view of what music was. Jorge Rossy also helped me a lot, was key in hooking me up with the likes of Kurt Rosenwinkel, Ben Monder or Bruce Barth. A year after that I moved to New York and I've been here for 15 years. 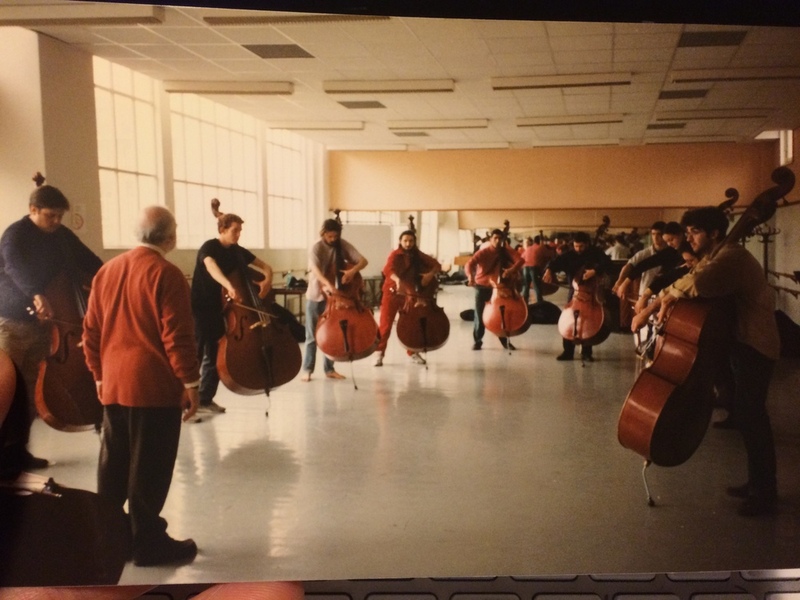 It is without a doubt that I could have not possibly survived any of that if it weren't for that solid foundation that François Rabbath and his New Technique for the Double Bass gave me. . For that I will be forever grateful. Thank you Maestro! I love you.